I am a 65-year-old woman and I now know that it’s never too late to begin serving the Lord! I am a 65-year-old woman and I now know that it’s never too late to begin serving the Lord! I have always liked listening to mission stories and have always wondered if I could have my own mission story. Well, I have just finished my first assignment as a volunteer, and what a journey it has been! I had been alone for a couple of years and I just felt that I had to do something meaningful. What could be better than working for the Lord? So I applied under AVS and was accepted to serve as a Preschool Teacher on the island of Chuuk. My AVS Coordinator helped me with purchasing tickets, which were well over 4,000 USD. My entry permit took a very long time to come, but it finally did. I was ready to serve – or so I thought! In December of 2011, I set off on my journey – away from Norway and away from my comfort zone. I was told that I had to pay for one of my two suitcases, but the lady at the customs desk was busy helping me get my suitcases checked and forgot to charge me. I realized this and went back to let her know, but she told me it was too late. I thanked God for that blessing! Upon my arrival in Guam, I discovered that I was missing a visa that I didn’t know I would need. I prayed fervently that everything would be alright and the officers were very kind to me. It was another reminder of how good God is. The sun was shining as we touched down on Weno, a relatively small island, and it was hotter than I imagined. The one road that went through the whole island was in such bad condition; a five mile ride took us 45 minutes! The humidity was tremendously high, and my hair, body, and clothes were perpetually wet, unless I was in an air-conditioned room. I was to share room with a girl from the Philippines; her name was Lee Anne. We had been chatting on Facebook, so we sort of knew each other already. The apartment was better than I had anticipated; it even had a shower, although the water either never came out of it, or only trickled out. We also had rats in our apartment, so I bought some sticky traps and we caught ten in two weeks. There were 18 of us on the school campus, including the principal, Mr. Walter John and his wife. They became my very good friends. There were also two American volunteers, and the rest were from the Philippines. The school had about 200 students and went from Preschool to 12th grade. There was a tall fence around the campus, with a padlock, and there was a security guard on duty every day except the Sabbath. The Chuukese were ever so friendly; they always waved and smiled to us as we passed by in our van on the way to town. Quite a few of them didn’t work as they had relatives in America, Hawaii, or Guam who supported them. Some would sit along the road, half drunk, and chewing betel nut mixed with tobacco. They had a bad habit of throwing stones at those who passed by. Once, they even hit our van in broad daylight. We never went out after dark and spent almost all our time on campus, unless we were lucky enough to go out in a boat with the Pastor. This meant that our group of volunteers became close, like one big family. My day started at 8:00 in the morning, with worship. From 8:30 to 12:10 I taught Preschool and English to the 11th graders. In the afternoon, I was free. The power would be cut from 3:00 to 6:00 and then again at 10:00 at night. We called it our curfew, because the power would only return at 6:15 in the morning. This was done to save money, but it was so difficult for me to sleep in such heat and humidity. In my free time, I would often walk down to The Blue Lagoon to swim and sunbathe. Weno is a haven for divers, so I got to know quite a few people from all over the world. I was able to tell them about our school and witness to them. I also invited them to come and visit us. Some did, and they were delighted to hear the kids sing in their mother tongue. Once we had seven people join us for vespers, and I cooked a meal that we shared afterwards. I am very much a people person, so I loved having everyone around me. I had 16 preschool students, who were all adorable. I loved them to bits and they loved me too. Whenever they would say “Teacher, we love you” in their soft voices, my heart would melt! To receive so much love from them was so incredibly rewarding. Even their nannies and mothers told me that they loved me. I felt so humbled to hear it. I felt that God had really blessed me and allowed me to do His will there. The sleepless nights, rats, and other insects were worth it! I would gladly pay double just to do it again. My 11th graders were somewhat noisy, but I loved them too! They didn’t want me to leave, and when they prayed, “Lord please look after Miss Reidun, we love her,” tears welled up in my eyes. I really miss them! They used to sing for me with their beautiful voices, and they even made me a CD with Christian songs, sung in Chuukese, much to my appreciation. Our principal was a very nice person and always provided whatever I needed. His dear wife persuaded me to visit Pohnpei, which she said was such a beautiful island. So I bought a plane ticket and went with a friend. The day before we left, we had to visit the Immigration Office to get clearance to leave Chuuk. As it happened, I had lost my original entry permit, but I had a copy with me. The officers told me I couldn’t leave without my original entry permit. I asked my friend to pray for me while I talked with them. They remained determined to keep me from leaving. They told me I had to apply for a new permit, which would take 2-3 weeks to arrive. I couldn’t hold back my tears. My roommate, Lee Anne, pleaded with them. They suddenly changed their minds and told us to go to the Supreme Court and explain. We rushed to the courthouse and then back to the Immigration Office, just as they were closing. They told us to return the next morning and everything would be alright. Praise the Lord! The next morning, we were all excited to leave. However, more problems cropped up. We had two different officers to deal with and they were not helpful at all. We pleaded and prayed and they finally agreed to let us go if Mr. John, our principal, would give us permission to leave in writing. The Immigration Office gave him a really hard time and asked him many questions, but they finally granted us permission to go! Sapwaufik is a little island. It only has about 400 people on it! There’s no electricity, so the people wake up with the sunrise and go to sleep with the sunset. There is a shop, but there’s not that much to buy in it. One can walk over the entire island in less than one hour. There is no Internet and no cell phone service, but there is a radio if there are any emergencies. Traveling to the island takes about six hours by boat, if the sea is calm; if the sea is rough, it could take double the time. By plane (10-seater), it would take about an hour and the plane only operates when it can get the full number of passengers. There is a nurse on the island, and the school and church are situated right on the beach. The people are friendly, but have threatened to remove their children from the school unless they can have a teacher from abroad. It will certainly be a challenge for me to live without all the commodities I have been used to. But if that’s God’s will, then so be it! The pastor on the island told me that I was an answer to their prayers! Weno, Chuuk, has been a beautiful place in which to serve! I was even lucky enough to visit the other islands nearby. It is so difficult to describe the beauty of it all. Weno, Chuuk will always be special to me, as will the other volunteers I have met. I will never forget my gorgeous preschool students and my loyal 11th Graders. I have a special burden in my heart for them and will continue to pray for them, as they are kind enough to pray for me. I really thank and praise the Lord for allowing me to serve in Micronesia. Come January, I’ll be back – serving on Sapwaufik! Reidun Wergeland is originally from a town called Arendal, on an island in the south of Norway. 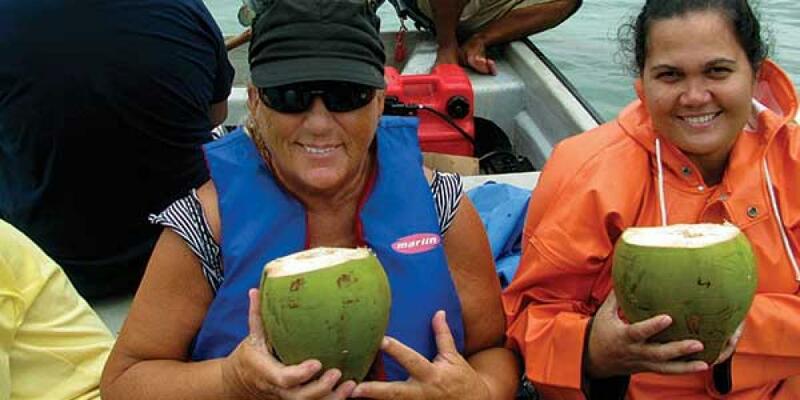 She first served as a Pre-Kindergarten Teacher at the Chuuk SDA School from October of 2011 through May of 2012. Currently, she is serving as an ESL and Bible Teacher in Brazil, and will complete her assignment there in December of 2012. She then plans to serve as a teacher on Sapwaufik, an atoll belonging to the State of Pohnpei.